I was a little surprised when I finished this scarf. Had I really knit for 64 inches? Was that the end of the second skein of yarn? I enjoyed every inch and every single one of the approximately 2,448 cable crosses (yes, I calculated). I could have gone on floating. What’s next? Modifications: My scarf seemed a little stiff, so I went up one needle size and eliminated one pattern repeat (5 stitches). I finished these mitts in two evenings of knitting. I love them. L. O. V. E. them. I ended up “designing” my own by cobbling together my favorite parts of the free patterns I found, because my yarn was just too heavy to do justice to the lovely Knitspot patterns. I have plans for them already. I used Garter Rib, one of my favorite stitches from Sensational Knitted Socks. It’s got texture, it’s got a little ribby stretch, and it shows off my yarn. 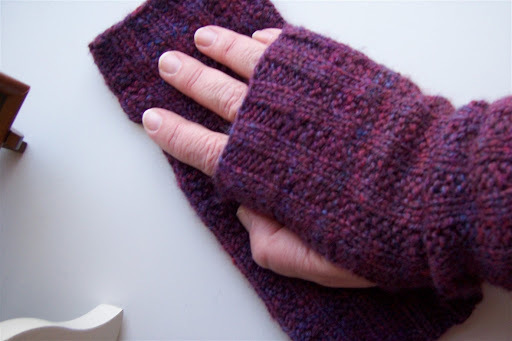 The mitts have 2X2 rib cuffs and a vertical slit for the thumb (Look Ma, no gusset!). At first I thought I’d made the wrist part too long, but now that I’ve worn them I like how it scrunches comfortably. And they’re so warm! It’s true (at least for me) that if your wrists and hands are warm that your fingers warm up, too. As I was knitting along on the mitts I hatched a plan for a little scarf to match them. 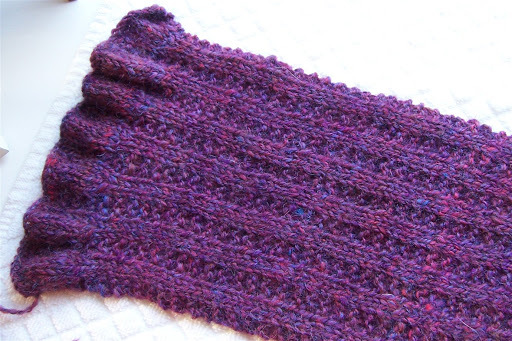 I wanted to use the same Garter Rib stitch, but I also wanted to frill it up a little bit. I figured out how to knit little ruffles at the beginning by casting on as if I was going to knit a 6X2 rib. Then I ssk-ed and k2tog-ed in the right spot on every other row until I was back to the 2X2 count for the pattern. I’ll be able to work the ruffles in reverse at the other end, too. I think this little scarf has just the right amount of cute. I’m not too happy with the way the edges are sitting (or curling, rather) so I’ve given the end a little test-block to see if it will lay flat (it’s damp in the photograph). If it won’t, I have no qualms about ripping it out and starting over. All this knitting activity seems to help take the dull ache out of my hands. We are doing so much book-moving at the store that I come home each night feeling like my hands belong to someone else. I’m very careful to lift no more than I can carry, and to use both hands whenever possible, but there’s just something that happens when you shelve and re-shelve books for hours at a time. Why does knitting help? I don’t care; I’m just glad that it does! The scarf is stunning! I can only imagine how wonderful it feels, knit out of Sundara’s yarn. And the mitts are really cute!! 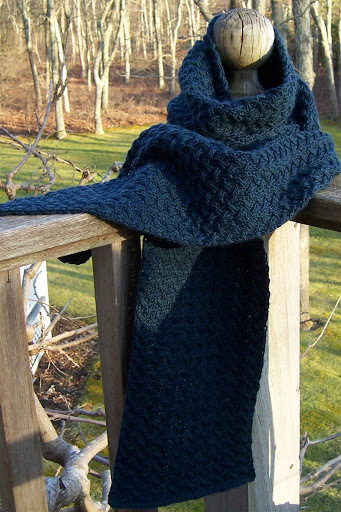 Gorgeous deep blue scarf and especially beautiful mitts and scarf beginning. Your handspun is wonderful. Fab colour ! Love how you did your own ‘thing’ with the fingerless pattern. Maybe some day I’ll be good enough at this to venture out on my own. Right now I’m on to my second pair of Fetchings, but I didn’t like the way the first pair rolled back, so will try and figure out my own ending in this pair to keep the wool closer to my fingers.I’d love to do Grumperina’s scarf but I am not sure about all the cables involved having just learned the basics with the Fetchings. Yours is beautiful.I have Raynaud’s syndrome, so I was skeptical that the ‘fingerless’ gloves would really do the job. Like you stated, as long as your hands are warm, the fingers just follow through. As always Jane, loved your post. Ooh! Ruffles! I’ve been in the ruffly mood lately. I have got to try that scarf pattern, it must feel great around your neck. The handspun is perfect for the mitts. This way you get to pet it all day long. Hi Jane. I’ve had to delurk here now that you know I read your blog regularly (I’m goldiegirl from KR)Cool fingerless mitts! Your own design and your own handspun, too! You should be very proud. And the scarf? Gorgeous. I love that design and yarn combo. After I get a few projects in the queue done I’m off to order from Sundara.And Lynne – I, too, didn’t care for the way the Fetching bind off rolled, so I just bound off in the pattern. It seems to work well. You have been BUSY! Your shifting sands in stunning! I love the mitts and scarf too – good luck on the scarf design! The yarn and pattern for your fingerless mitts worked out very well. I like them. I like how your scarf is looking so far too. Oh my goodness, you are killing me with that scarf. Perfect color, and that pattern is gorgeous. But, I’m afraid I would gouge my own eyes out if I made one. For an Irish Studies person, I’m not sure I love cabling enough . . .
Can I be a post on your deck? The get to be wrapped in the most beautiful scarves and shawls! The scarf is beautiful! And the mitts look so comfy. Thanks again for your blog help at KR! That scarf it just fantastic! Great color also! the mitts are lovely and the scarf… well, all’s I can do is sigh when I look at it 🙂 truly lovely.